Poetry Off the Page Symposium, May 18-21, 2012, U.A. Poetry Center, The University of Arizona, Tucson. Panels, performances, classes, and presentations by Amaranth Borsuk, Black Took Collective, Julie Carr and K.J. Holmes, Brent Cunningham, Christine Hume, Douglas Kearney, Ander Monson, Julie Patton, Claudia Rankine, Cecilia Vicuña, Dan Waber, Joshua Marie Wilkinson, with exhibits and screening of original fim/videopoems. Visit: poetry.arizona.edu. 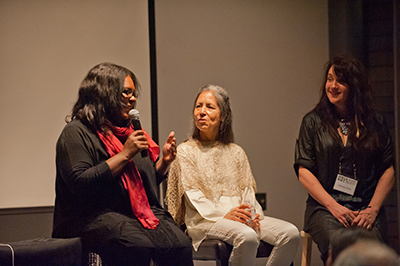 Left to right: poets Claudia Rankine, Cecila Vicuña, and Christine Hume answer questions from Poetry Off the Page symposium participants, Friday, May 18, 2012. Photo by Ben Bessick. If a poem isn't on paper, where is it? The University of Arizona Poetry Center hosted its third biennial symposium, Poetry Off the Page, Friday, May 18 to Sunday, May 20, 2012, in Tucson, Arizona. The only paper distributed at the event was the stylish brochure featuring over thirty artists, and the lanyard nametags everyone wore around their necks, summer-camp style. Poems were brought to life as non-recyclable sound recordings cut to loop or as modern dance performances. Poems were improvisational mixed media—words typed and simultaneously projected onto a screen. In one exhibit, the poem took the form of several sculptures of bird nests. Without paper, poetry became experiential works of art that fuelled conversation and broadened horizons. "My definition of poetry has expanded," said University of Arizona MFA candidate Meg Wade. "I never really was given the opportunity to see other ways to push the medium…video poems, audio poems. I didn't realize the full capability. I was changed." Friday set the tone for the rest of the three-day symposium, acclimating audience-members (many arrived looking quite stiff) to the sensory-saturated experience. In poet Christine Hume's "Speech Talks Back," the first performance in the Sonic Lens series, Hume layered audio and "nonliterary" speech recordings, some cut to loop. There was a bit of Donald Rumsfeld's "known knowns" and "known unknowns" talk; a quote from one of the Harlem Six, and snippets from interviews and 911 calls from the Trayvon Martin case. 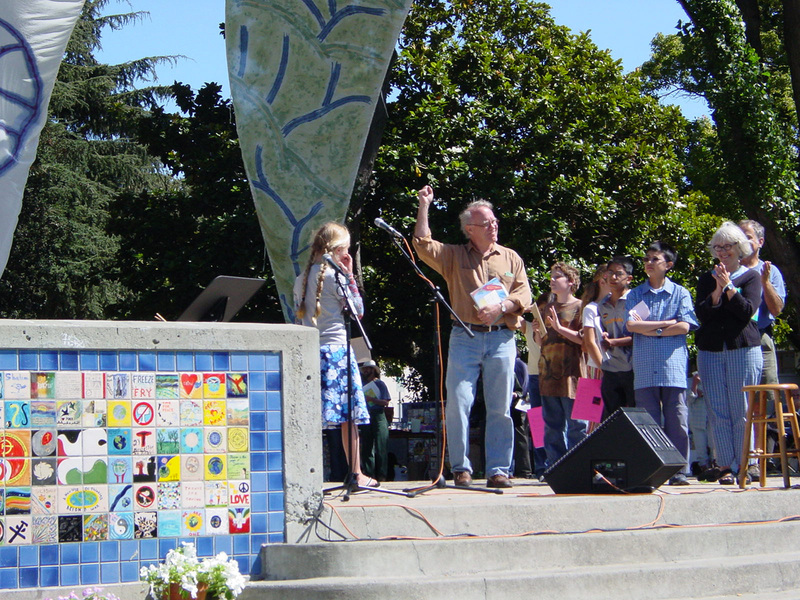 Hume prefaced the audio show by asking the crowd to close their eyes. Her poetic voice-over used the sound of footsteps on asphalt and snow, leading the audience on a disembodied journey through a labyrinth of headline news. People wiped their sweating palms to the rhythm of Hume's recorded environments. In collaboration with Hume's political theme, and in response to Trayvon Martin's death, Claudia Rankine and husband John Lucas's film Undocumented and Here, set in a hip-hop clothing boutique, confronts the notion of black male identity in the United States. The film's cast, made-up of several of Rankine's students, tried on hooded sweatshirts in the 'mirror' of a video camera lens. Rankine said she interviewed several black male poets, including friend Jericho Brown, about their interactions with law enforcement and other authority figures as research for the piece. In the film, several cast-members relayed their experiences being pulled-over and interacting with cops. 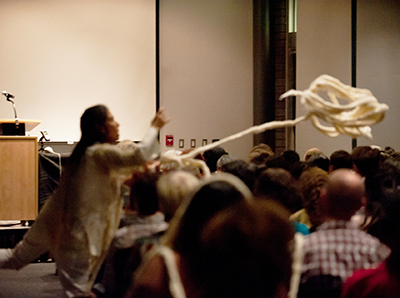 Cecila Vicuña "weaves" Poetry Off the Page participants with a room-length string of yarn, Friday, May 18, 2012. Photo by Ben Bessick. Performance artist Cecilia Vicuña entered the Poetry Center's Rubel room with her breathy, child-like voice, in the form of an ecstatic chant, which she projected from a headphone mic for several minutes before emerging from somewhere in the back. "It was an intimate experience," said University of Arizona M.F.A. candidate Ben Rutherfurd. "My eyes were closed…you're kind of cut off from your surroundings. 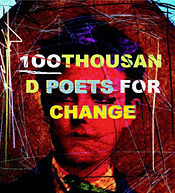 It intensifies the relationship with the poet's narration." She draped a room-length string of yarn, resembling an umbilical cord, on crowd-members' heads and shoulders while chanting wildly about her life in the desert heat, living on Sonoran lands whose natives practiced spoken poetry and ritual for thousands of years. When asked to perform at the symposium, Vicuña said she initially laughed at its title. "Poetry has always been off the page. Poetry is only visiting the page," she said. Many of the weekend's symposium performances and panel talks are available on Voca, the Poetry Center's audio video library. Visit the University of Arizona Poetry Center http://poetry.arizona.edu, or Voca at http://voca.arizona.edu for more details. Andrea K. Francis is an M.F.A. candidate in poetry at The University of Arizona. She recently attended the eight-week summer graduate poetry workshop with The University of Iowa Writers' Workshop. She was a 2012 finalist for the Patricia Goedicke Prize in Poetry and her work appeared in CutBank. She lives and teaches in Tucson, Arizona.